pronunciation "you-stress". I seriously doubt I've ever produced good stress for myself, have you? 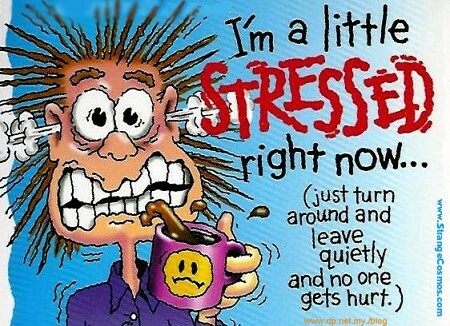 Distress or unpleasant, bad stress is my constant companion. I work on stress management but never seem to counteract "life" with simple management techniques. Paul tells us in 2 Corinthians 12:10 "Therefore I take pleasure in infirmities, in reproaches, in necessities, in persecutions, in distresses for Christ's sake: for when I am weak, then am I strong." Do you take pleasure in these things? I'm not so sure I'm there yet some days. There's plenty of distress in the Bible, the word appears 52 times. I didn't find the word eustress once. But, I believe God describes it in the verse as "taking pleasure in distress" for his sake. We do this more than we think. We joy in the cross of our Savior. We take pleasure in his distress for his sake and "our" sake. If not for his distress, we would never experience a cure for sin. Seems I can't create my own eustress, Jesus did it for me! Read Psalm 107. Cry out and God will deliver you, save you and bring you out of distress. JESUS = Best Stress Management Technique Ever! Check muscle tension by scanning. Check different muscles in your body as if mentally X-raying each part and look for tension. Start at the top of your head and work down. Check your forehead, eyes, jaws (are you clenching your teeth?). Move to your neck and shoulders and check for tension or pain. Next your arms, chest, stomach, upper legs, calves, feet and toes. Check hand temperature. Place your hand on the side of your neck just above your collar. If your hand is noticeably cooler than your neck, your hand temperature indicates that your body is probably stressed. Check for nervous sweating. Many people perspire when they are tense. This is an involuntary stress response caused by the secretion of certain stress hormones. This is yet another simple indicator that your body is responding to some stressor. Check for rapid, shallow breathing. Relaxed individuals breath slowly and deeply with their stomach muscles. Tense people often tighten their stomach muscles and breathe through their chests. The chest doesn't expand as much as the stomach resulting in rapid, shallow, chest breathing. A relaxation technique for stress management is to learn to breathe in a relaxed manner. Relax the stomach and breathe in slowly, filling the stomach first and then the chest. Relax again while you exhale and repeat. You like-a? Share with your friends or leave me a comment! l love mail!